Depart from Baska Voda, at the foothills of magnificent Biokovo; a spectacular union of mountain and sea. On the western side of the Makarska shore awaits the Julia I, a 2003 Oceanis Clipper 473. 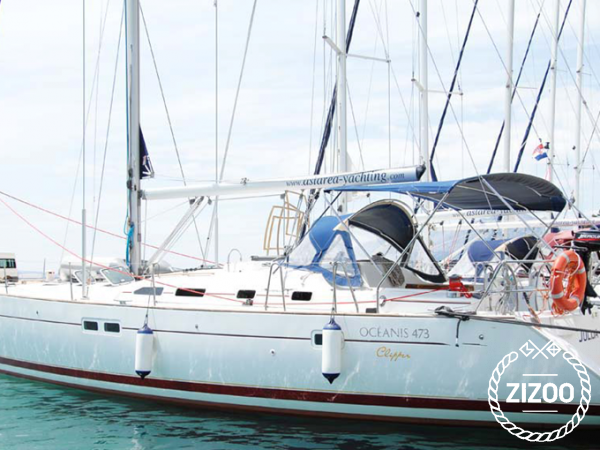 Equipped with 4 cabins sleeping 8, plus an additional 2 berths in the salon and 2 bathrooms, this spacious yet cosy family-friendly sailboat is a fantastic opportunity to spend a holiday on the Adriatic Sea. Explore the magnificent beaches on the Island of Brac, and Zlatni Rat in particular. Its swaying tip is a tourist magnet, as the shape of this sandy beach changes with the tide. Or explore the deep blue around the Island of Vis. Anchor and dive in and perhaps get lucky and swim with the dolphins. The kids will love the shallows in Komiza, and the parents will adore the fresh seafood served at one of the many renowned restaurants in this charming little town. There are so many options and so many opportunities. Your crew will help you with all the details.